Our 2D tests have determined that the Core 2 Duo range is blisteringly fast, no matter which part of the architecture our benchmarks test. Will it be the same for gaming? To mimimise GPU load on a stock-clocked Sapphire Radeon X1900 XTX 512MiB graphics card, we ran the benchmarks at 1024x768 with no extra image enhancement. CPU horsepower should be a telling factor, then. Pentium E.E 965 lags a little ways behind FX-62, as you'd expect. 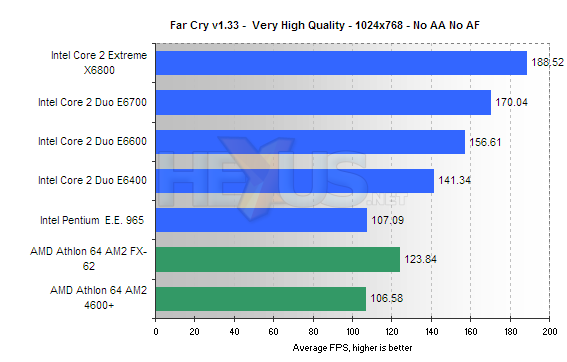 Intel's Core 2 Duo, though, demolishes the gaming framerates produced by AMD's Athlon 64 FX-62. The Intel Core 2 Extreme X6800 is 52% faster than the best AMD has to offer, and Core 2 Duo E6400 is over 30% faster than the best of Intel's previous generation. Scary, huh? 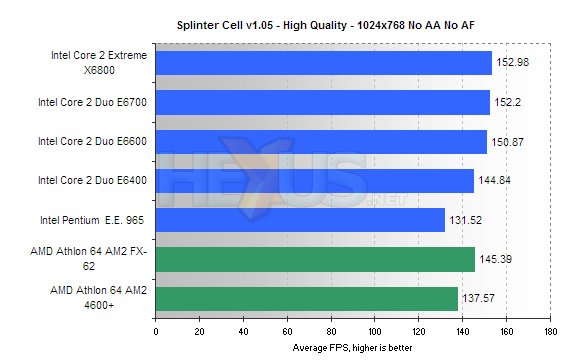 The E6400's 2MiB cache doesn't seem to hinder performance much. 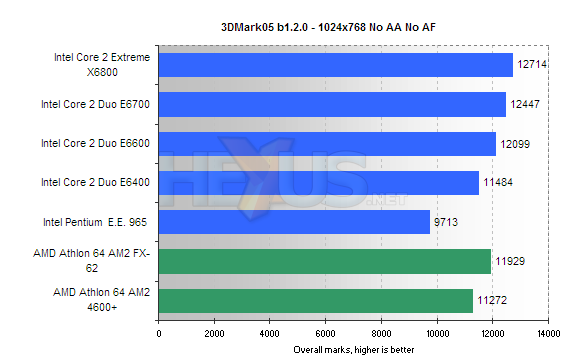 What you should realise is that there's no mystery why Core 2 Duo's faster. 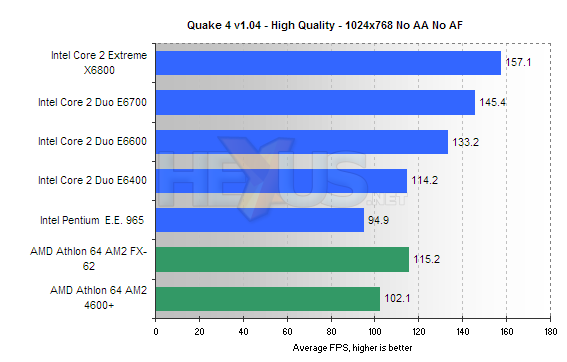 Intelligent architecture design, encompassing low-latency memory access, impressive data prefetching/loading, and a 4-wide execution path all combine to produce the highest Quake 4 numbers we've seen thus far. Splinter Cell: Chaos Theory, by comparison, appears to be GPU bound. There's not much change when looking at numbers from 'E6600 to 'X6800. Even 3DMark05 loves Core 2 Duo.